I was recently reminded of a humorous experience from 2003, the water drinking contest. 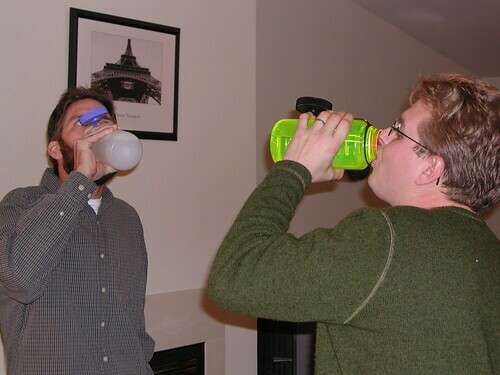 My friends Brett & John argued about who could drink a liter of water the fastest. There's really only one way to settle such an argument. Brett won the contest by a small amount. Then he made the unfortunate decision to quickly repeat the contest against me. He beat me, then immediately ran to the bathroom to vomit. That was the night we learned the human stomach does not hold two liters of water. As I recall I was the only one who was not disqualified for vomiting. So in another more accurate sence John is the winner, but I'm up for a rematch whenever. John, you must be misremembering, because I certainly didn't vomit. after getting pregnant but before Zofran, i would vomit every time i took 12 or more sips of water. i thought of this water drinking contest every single time that happened. thanks for the reminder! that's so funny, I'm still laughing. next post...who can take off their pants faster? Oh, I seem to remember a fair amount of vomiting in the bathroom.